I apologize I haven’t written here lately, it has been a challenge to stay in touch with everyone and even though I know this is the best way to do it, it’s been hard to find a moment to write here. I want to start by saying a huge thank you to everyone for their constant enduring support. Without all of your love, direction, support, inspiration and guidance this transition in my life would have become a lot more complicated. I realize after reading our last post here that for many of you my situation seemed bleak and there wasn’t a whole lot anyone could do about it. Truth is, I did go through a situation this summer where hope was easily lost, control was not mine, life seemed a dark place and I was the only one who could take it back. I appreciate everyone giving me some space despite your concern. It had really become trying to reiterate my situation on a daily basis. When I woke up that morning and had lost everything I had worked so hard to get back it crushed me and the last thing I wanted to do was reiterate what a confusing and scary situation both Katrina and myself were in. As all of you know Katrina’s constant guidance has been crucial for my well being over the past nine months. It took her telling me over and over again that “reiteration of my situation was not helping my healing process,” for me to realize it myself. Everyone’s genuine concern for my situation had led me to live not in the moments that lay ahead, but often in the tragic moments that had become part of my past. This is such a natural occurrence… our concern for each other that stems from love can often become stress for the recipient of our concern. The last thing the injured, sick or distraught person wants to do is become a concern or burden for those who love them. Throughout all of this I wanted to be seen as a beacon of hope — proof that life is what you make of it and hurdles were to be expected, dealt with and filed away. As I made rapid improvements in my health in those first few months, I was confident no one felt sorry for me; people were inspired by my hope and drive and life would get easier and I would move on. Waking up one random day, losing the sensation that I had hung to so tightly, rushing to the hospital to learn that my problems might not just be contained to the spinal cord but possibly the brain-stem above, put me back at the starting line with a whole new set of hurdles in front of me. Stress is a disease. A disease that unfortunately most of us share. The majority of the time stress will not kill you alone but pair it with any other sort of sickness, depression, cancer etc. and your grave awaits. 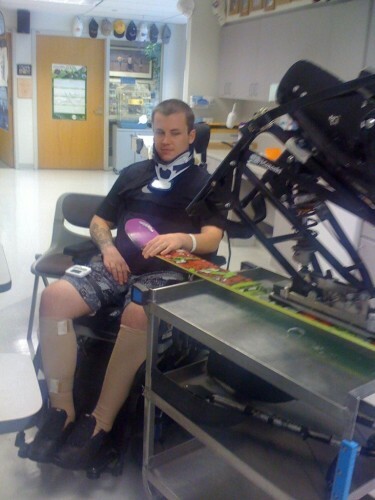 Spinal cord injury affects your nervous system. Stress affects your nervous system. Combine the two and you’re going to get results that no doctor will explain to you the same. The doctor in California was quick to regress my Asia status from C to A, she was quick to tell me that my once incomplete injury was now complete, she was also quick to tell me that the progress I had made up to that point might quickly regress. The fact that I could once feel my feet was a mystery to her. As my MRI’s spread across the country for different “professional opinions,” stress pulled up a seat next to me in my edit suite. The immediate concern of my close friends and family was to be expected, but was it helpful for me to be reiterating my situation? We thought not. So once again I thank all of you for respecting that and giving me some space during that trying time. The next few weeks were by far the hardest of my rehabilitation; I had to decide: could I accept my new reality and push forward toward that healing light or would I fold and accept my doctor’s diagnosis and my new life as a quadriplegic. Katrina once again stepped in and changed my life. The reason I had been so stressed is that I had taken on — or rather chosen to — finish a film project that meant the world to me personally. I knew from my hospital bed what a challenge that was going to be, I knew mentally I needed to show myself I was capable, I also knew taking it on by myself was not the rest and rehabilitation that I needed. It took Katrina pointing out to me that I was being hard on myself to expect that much of myself only five months after a catastrophic, life-changing injury. It took Katrina pointing out to me that I was taking on a task usually assigned to five capable people by myself. It took Katrina telling me over and over again that I had not changed as a person because my work ethic was still there and that’s what was going to get me to the finish line. It also took Katrina getting me out of bed, getting me fed and getting me back to a place where I could be creative and, as a result, proud of myself once again. The stress did not end there — not only had I decided to finish post-production on my film project but also take a new job with Nike that required me to relocate at the end of the summer. As our deadline of September 5th loomed over my head to both finish the film and move to Portland and start a new job it really only got worse. Then one day Katrina looked through our lease and saw a clause that would allow us to extend by 30 days giving us ample time to finish the movie and find a new place to live. I felt a weight lifted off my shoulders. What happened next was something that will change my life forever. It was the moment I realized that stress — although inevitable — was something that needed immediate attention in my life. I felt so much better that day, taking that weight off my shoulders, I asked Katrina that night to rub my feet and to both of our surprise not only could I feel a slight tingle but my toes were moving in response to Katrina’s touch! The next day I began noticing I felt like I had a little bit more core control… sure enough, it was becoming easier to lift myself up after weight shifts. And to both Katrina and my surprise the sensation and strength continued to come back! Finishing the movie and all the tedious tasks that come along with post-production became easier with a little more breathing room. Before I knew it the film was finished and being sent away for duplication and the world premiere in Montréal. Was stress really responsible for crippling me that much more? What would the doctors say about that theory? (They said no way) From September 10-15th Katrina and I traveled to Portland to look for housing and once again stress pulled up a seat. No one could ever fathom what a obstacle accessible housing can be until you have a need for it. The last month has continued to reveal hurdles around every bend. But what I am trying to teach myself (with Katrina’s help) is that the more I focus on these hurdles the harder it becomes to get beyond them. I know better than anyone that stress is a disease only curable by ourselves. I know many hurdles lie ahead for me and even if they trip me up my goal is to effortlessly move beyond them. This is easier said than done but I know my awareness will serve purpose for me in the future. In the last 30 days, I finished a movie that I set out to make two years ago, I took a new position at an amazing company, we released our film to the public to rave reviews in Montréal, and I wish I could say I helped, but I watched, the strongest woman in the world move our lives yet again (with the help of our great friends Jake and Lexi). Then I rode shotgun as Katrina put the pedal to the metal and got us the hell out of LA! We went out to Colorado for “The Meeting” (snow industry get-together and film festival) where we showed our film next to legends Teton Gravity Research at the top of Aspen Mountain. It was an amazing night that I will never forget; I saw so many friends that I had not seen since before my injury who commented that I looked like myself. I saw friends who I had seen in the hospital and they all couldn’t get over how much better I was doing and to top it all off, I asked Katrina to marry me in front of 500+ friends and supporters and she said yes! Wheelchair or not that’s a pretty good month! Yesterday a group of good friends and amazing people set out to ride from Seattle to San Diego in support of their fallen friends. In support of the Billy Poole, Shane McConkey and Riley Poor Foundations, this dedicated group of friends and athletes will take on physical exhaustion and the ride of a lifetime in yet another showing of how amazing the ski community truly is. Please follow their travels and lend your support if possible by visiting here.